Cesar Sayoc's Cesar Sayoc's initial court hearing took place as the 56-year-old faces five federal charges. The Florida man accused of sending packages containing explosive material to prominent Democrats and others who've been criticized by President Donald Trump had a list of more than 100 people to target, a senior law enforcement official told NBC. Cesar Sayoc's initial hearing took place Monday afternoon in Florida federal court. The 56-year-old faces five federal charges; he was arrested Friday in South Florida after investigators said they identified him through fingerprint and DNA evidence. Sayoc was seen crying in the courtroom before the hearing started. Prosecutors said they want to keep him behind bars without bond, arguing he's a danger to the community and a flight risk. A detention hearing was scheduled for Friday. Sayoc is being prosecuted in New York, so his Florida hearings will likely be brief and process-oriented. The main issue will be whether he waives extradition to New York and whether he seeks release on bail. Authorities say Sayoc faces more than 50 years in prison if convicted on all charges related to pipe bombs sent to political figures across the country. None of the bombs exploded and no one was injured. Jamie Benjamin, one of three attorneys representing Sayoc, told NBC News that they plan to challenge every piece of evidence presented by the federal government in the case. One of Sayoc's attorneys, Daniel Aaronson, urged people not to rush to judgment based on media reports. "Right now, we know very, very, very little," Aaronson said of the case. "We do not know all the evidence the government has. You have to keep in mind he has not been found guilty of anything." Law enforcement will be informing politicians, entertainers and members of the media of Cesar Sayoc's alleged intention to mail them a crude pipe bomb, the source said Monday, as an Atlanta post office was evacuated for a new suspicious package similar to the others. CNN President Jeff Zucker said "another suspicious package addressed to CNN was intercepted at an Atlanta post office." An FBI bomb squad responded. 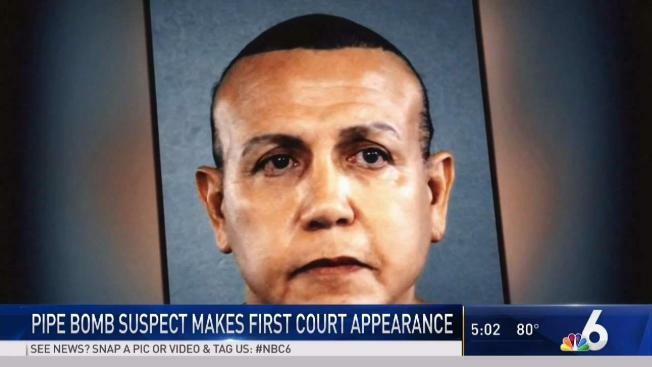 That package appears to be similar to the 14 others allegedly sent by Sayoc, a law enforcement official told NBC New York. The Postal Service and FBI believe Sayoc was mailing some packages over days, including as late as Thursday. Zucker's statement said that all mail sent to CNN offices in the U.S. have been screened off-site as of Wednesday, when the office in midtown Manhattan was evacuated over one of the packages containing a crude pipe bomb. Prosecutors say Sayoc, a fervent Trump supporter, unwittingly left behind a wealth of clues, affording them a critical break in the coast-to-coast investigation into pipe bomb mailings that spread fear of election-season violence. Bubble-wrapped manila envelopes, addressed to Democrats such as Barack Obama and Hillary Clinton and intercepted from Delaware to California, held vital forensic evidence that investigators say they leveraged to arrest Sayoc four days after the investigation started. Sayoc is believed to have built the bombs in his van, which was covered in pro-Trump images and right-wing propaganda, multiple senior law enforcement officials briefed on the investigation told NBC News. "Criminals make mistakes so the more opportunities that law enforcement has to detect them, the greater chance they're going to be able to act on that, and that appears to be what happened here," said former Justice Department prosecutor Aloke Chakravarty, who prosecuted the Boston Marathon bombing case. In the hours before his arrest, Sayoc was spinning classic and Top 40 hits in a nightclub where he'd found work as a DJ. That evening, investigators were capitalizing on his own mistakes to build a case against him. And he was probably unaware that investigators scouring his social media accounts had found the same spelling mistakes on his online posts — "Hilary" Clinton, Debbie Wasserman "Shultz" — as on the mailings he'd soon be charged with sending. Correction (Oct. 29, 2018, 4:19 p.m. ET): An earlier headline on this story mischaracterized whether Sayoc would waive extradition.